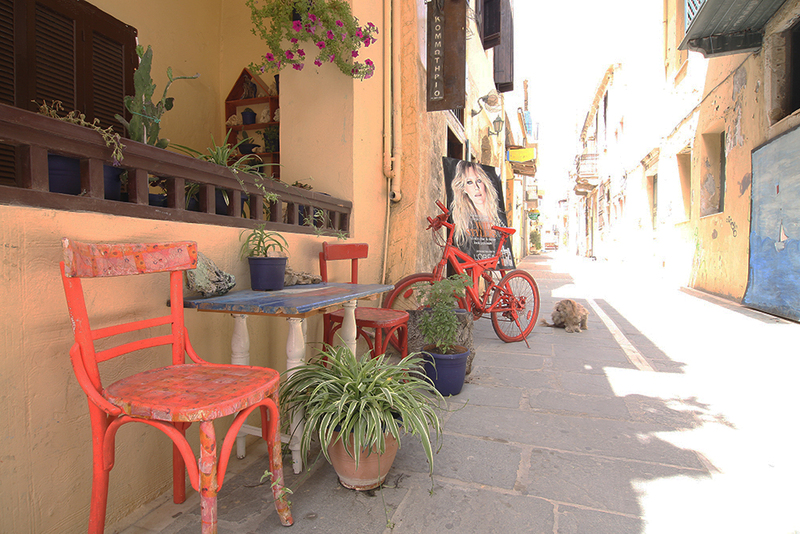 Seven days in the picturesque, small city of Rethymno, Crete, are more than enough to explore its beauty! 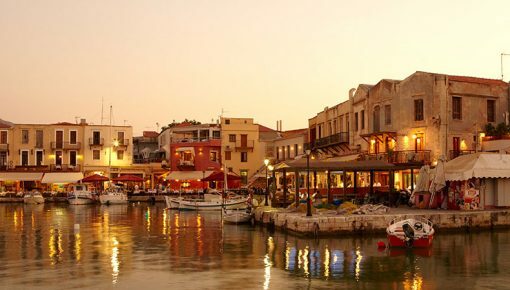 The Venetian Old Town with its Fortress, the traditional cafes and taverns where you will enjoy the famous Cretan retreat with raki, the crystal beaches and the beautiful villages around Rethymno will narrate you its fairytale. 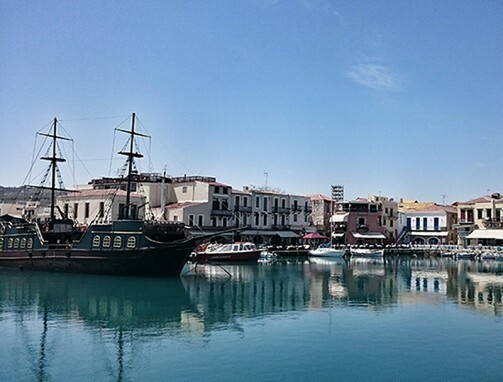 The Old Town, which is the reference point of Rethymno, but also the jewel of the city, lies between the Castle of Fortezza and the Venetian Harbor. 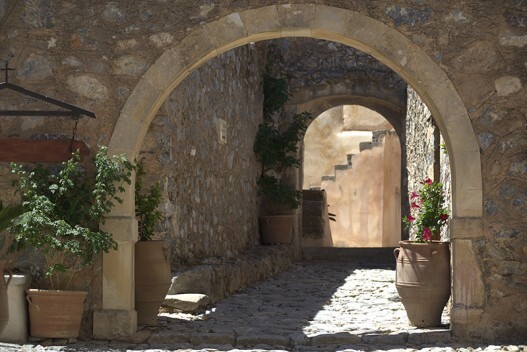 A stroll through the picturesque stone alleys and traditional buildings, takes you mentally in bygone eras. Passing the Great Gate, the scenery looks like a fairytale. 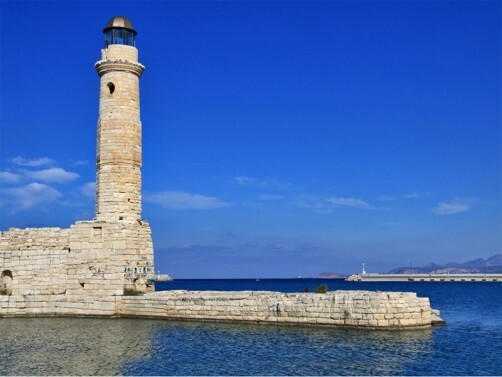 Looking for accommodation in Rethymno? 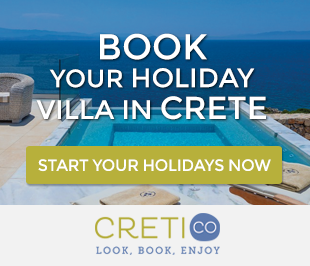 Check out these traditional holiday villas in Rethymno! Well preserved buildings, Venetian architecture, colored flowery courtyards, arched passageways, impressive wooden doors and fountains. 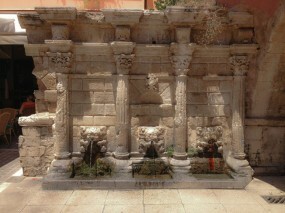 The most famous is Rimondi fountain in Petichaki Square, one of the most picturesque corners of the Old Town. 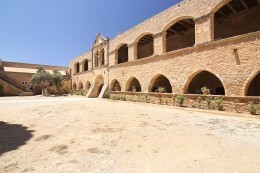 The Fortress of Fortezza, on the hill of Palaiokastro, can offer you a panoramic view of Rethymnon. Back to the Old Town again, the promenade of the Harbor invites you for a romantic stroll. The sea breeze will refresh every cell of your body, while you will observe the waterfront taverns and cafes one next to each other. After taking some photographs of the marina with the traditional fishing boats, luxury yachts and impressive sailboats, it’s time for you to taste Cretan specialties in one of the taverns of the Old Town. 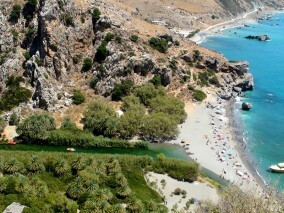 The beach of Preveli is situated on the south coast of Rethymno, about 40 kilometers from the city. You follow the road leading to Plakias and just after Lefkogia, you follow the sign to Preveli. 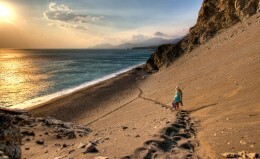 It is a unique sandy beach, beautiful, with a small forest of palm trees that make it look exotic. 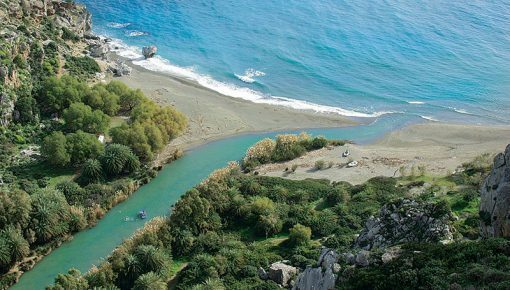 At this point, on the beach, you will see the estuary of “Kourtaliotis” river which has enough water even in summer. It forms a small lagoon before flowing into the sea. 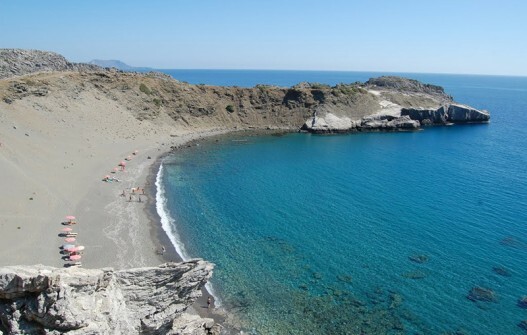 So if you visit this beach, you will have the unique opportunity to swim either in the salty waters of the sea or the freshwater of the lagoon and the river! Fantastic experience would be also to walk through the forest, crossed by the river. 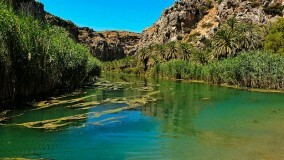 The palm trees on the river provide shade and the soil is smooth and sandy. At times, you may believe that you are in an African oasis. 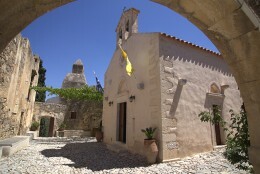 At the end of your trip, do not forget to visit the Monastery of Preveli, offering magic views, and its Museum. 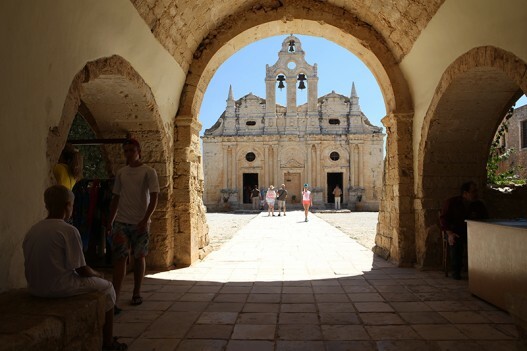 Heading south again, on the third day of your holidays in Rethymno, you can make the first stop at the Monastery of Arkadi village. It is dedicated to the Transfiguration of the Saviour and the Saints Constantine and Helen. 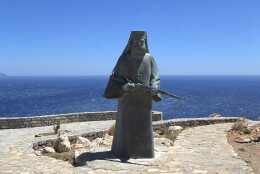 It is of great importance as one of the most striking examples of the Cretan Renaissance, but also due to its intense role in the liberation struggles of the Cretans. 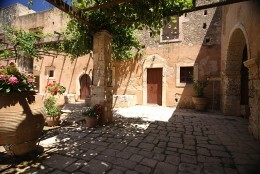 The Monastery was firstly built by the Venetians and it is dated back to the 16th century. 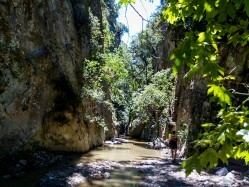 Continuing your route, the lush green Patsos Gorge at the entrance of Patsos village, may be your next stop. Entering the gorge, there is a path you can follow. A breathtaking view over the whole gorge can be admired from half way up on a higher plateau. 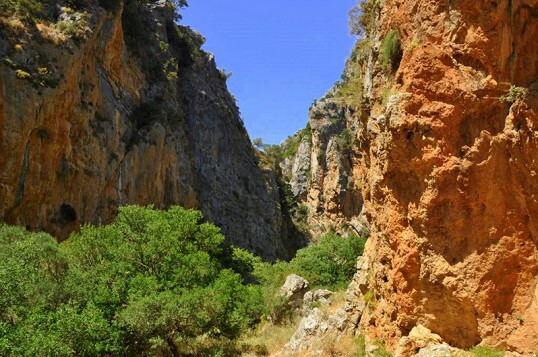 The gorge is steeped in lush vegetation and in its walls there are numerous caves with impressive stalactites and stalagmites. 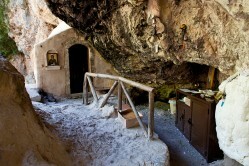 Higher, in a cave, you will see the chapel of St. Anthony with a natural altar outside. The walk through the gorge is quite easy and takes about 3 hours. 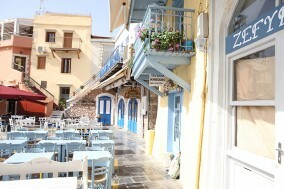 Southwest of Patsos, you will find the beautiful, traditional Spili village. Read more about this one-day trip. 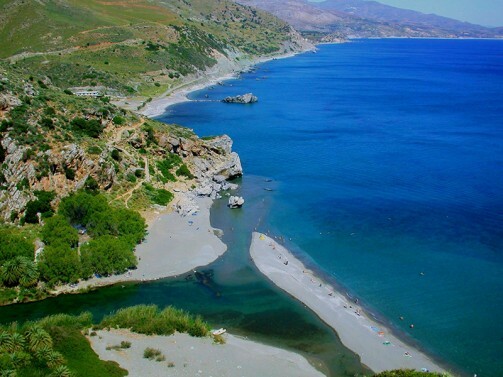 After the wild beauty of the mountainous Crete in Patsos and Spili, it’s time to visit one more of the most popular holiday resorts of Rethymno and Crete, Plakias village and its beach! 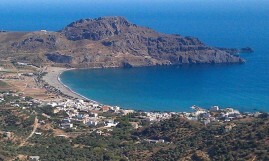 The main beach of Plakias is located east of the village and stretches for 1.3 km. It is a well organized beach with emerald, cool waters. Along the beach there is a promenade, ideal for strolling or cycling. Along the road, there are several restaurants souvenir shops and cafes, while on the beach there are trees, umbrellas, water sports, beach volley courts, canteens, changing rooms, showers. 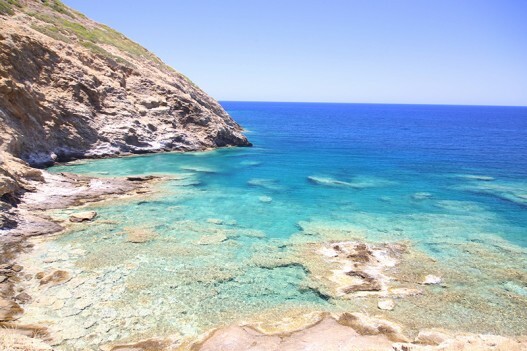 In case you prefer to stay in South Rethymno in order to explore this side of the Prefecture, then this traditional holiday villas in the area, is really ideal. 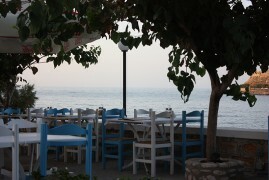 It is worth spending one more day of your week at south Rethymno, heading east of Plakias, towards Agios Pavlos beach. Swimming in one of its isolated inlets, formed by rocks and dunes, is really a unique experience. 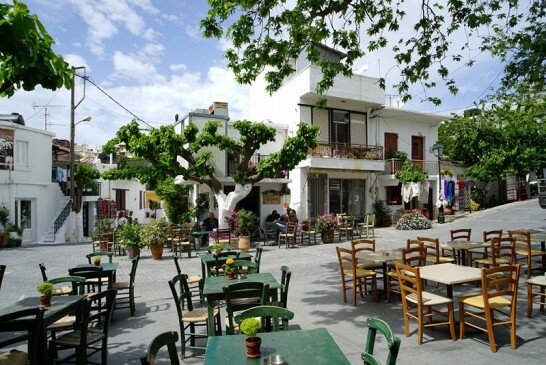 In Agios Pavlos settlement, you will find traditional taverns, where you can taste Cretan dishes. Friends of yoga will also enjoy their stay there, as the area is visited by many friends of the activity from around the world, taking part in seminars and events. 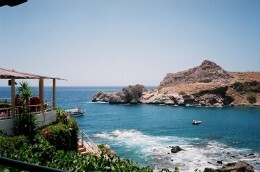 Your visit to Agios Pavlos will fill you with happiness and tranquility. 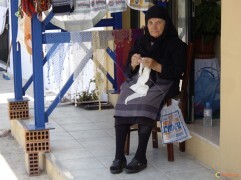 Anogia is a mountain village with 2500 permanent residents and is 55 km away from Rethymno. Hospitable and pleasant residents have to tell a lot of stories that have marked the tradition and the culture of the village. Today’s village has been built three times since it has been burnt down twice by the Turks, and once by the Germans. Anogia also has a great tradition in music and it is the birthplace of great musicians and performers. The stock farming, the agriculture and cottage industry are the main occupations of the residents. 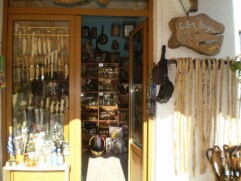 In Anogia you can visit the Folklore Art Museum as well as watch the weaving process and the art of glass manufacturing. Anogia is known for its excellent Cretan cuisine, so do not forget to taste it before you return back. Your week in Rethymno came to its end, but you have not visited yet the famous resort of Bali, about thirty minutes east of Rethymno city. Once, Bali was a small fishing village, but now it has been developed into a charming mass of colorful holiday properties. The resort consists of a number of small coves with sand and pebble beaches, a busy harbor and a selection of good taverns and bars. Bali today, combines the tradition of an old fishing village, with the range of facilities that modern day visitors have grown to expect. 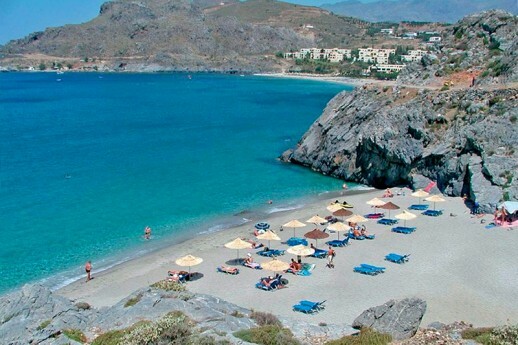 Posted on 05 Feb 2016 in Rethymno and tagged Anogia, Bali, Beaches In Crete, Beaches In Rethymno, Monastery of Preveli, Plakias, Preveli Beach, Rethymno Highlights.